AUGUSTA, Ga. — Rory McIlroy is leaving town with his fifth straight top 10 in the Masters, but that's little consolation after a poor round and four-way tie for fifth place. His two-over 74 was better than just four players Sunday. "Of course it's frustrating," McIlroy said Sunday evening. "But it's hard to take any positives from it right now, but at least I put myself in the position. That's all I wanted to do. The last four years I've had top 10s, but I haven't been close enough to the lead. Today I got myself there. I didn't quite do enough." 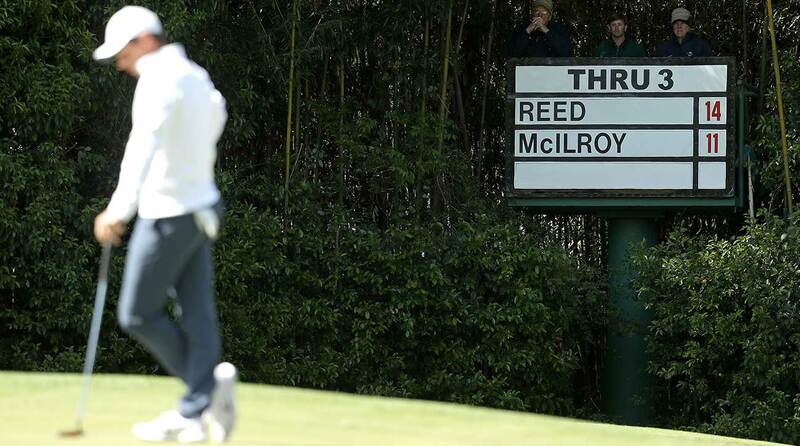 McIlroy trailed Patrick Reed by three after 54 holes, and their final pairing was touted as a highly anticipated Ryder Cup rematch that stretched back to Hazeltine in 2016. Some even considered the winner at that point to be a coin flip, as the majorless Reed was battling a four-time major champ and former No. 1 player in the world who had a big distance advantage off the tee. McIlroy had the upper hand early after opening par-birdie to Reed's shaky bogey-par start, but McIlroy fell back with a messy bogey on 3. He missed the green with a wedge and two-putted, while Reed canned a 15-footer for birdie to push the lead back to three. McIlroy birdied the 4th, but he managed just one birdie the rest of the way, which came on the 13th. That got him to 10 under, but by then Reed was already at 14 under and was more concerned about Rickie Fowler and a surging Jordan Spieth. "I feel like momentum is a huge thing, especially in final rounds," McIlroy said. "You look at what Jordan and Rickie did. They got on a roll and I didn't." McIlroy, who in 2011 had a four-shot lead after 54 holes but shot 43 coming in and signed for an 80, hit just eight greens in regulation on Sunday. Only amateur Doug Ghim hit less (six). "I'll sit down and reflect over the next few days and see what I could have potentially done better," he said. "Whether it be mindset or, I don't know. I just didn't quite have it today. I played some great golf yesterday. I just didn't continue that golf into today." McIlroy will be 29 the next time he plays the Masters. He still likes his chances of winning at Augusta National before his career is over, which could complete the career grand slam. Only five have accomplished the feat in the modern era. "Oh, yeah, 100 percent (I can win here)," he said. "I just haven't played it well enough at the right time."